Proper bracing is critical for a strong structure that will stand up to mother nature. 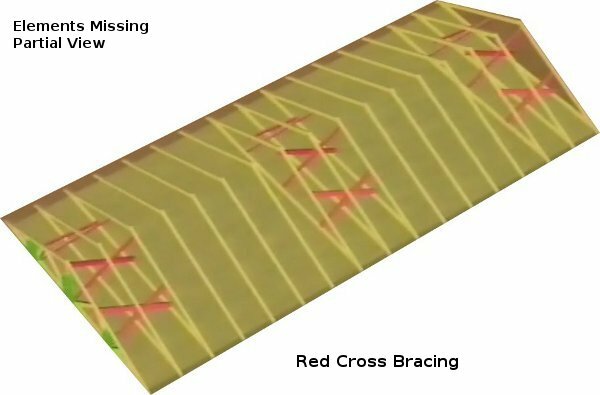 Images on this page use colors to identify bracing. As spans increase, bracing becomes even more critical. Smaller structures that are sheathed in metal or osb require less bracing assuming proper truss connection details are used. Purlins 24" oc are typical along with the bottom bracing shown. To strengthen the roof system truss clustering (cross bracing and wind bracing) is recommended at both end of the buildings and every 20 ' for longer span buildings. 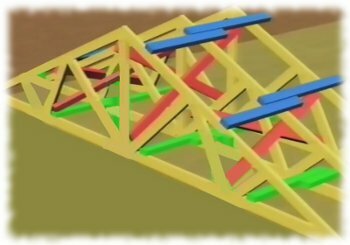 For maximum strength this image shows a cluster of three trusses tied together. Stagger top and bottom cord bracing so the lumber 'ends ' on different trusses for additional rigidity as you work your way down the building. At both gable ends, and at least every 20' add wind bracing (green) for truss clusters. The images below show these critical components and their recommended placement. 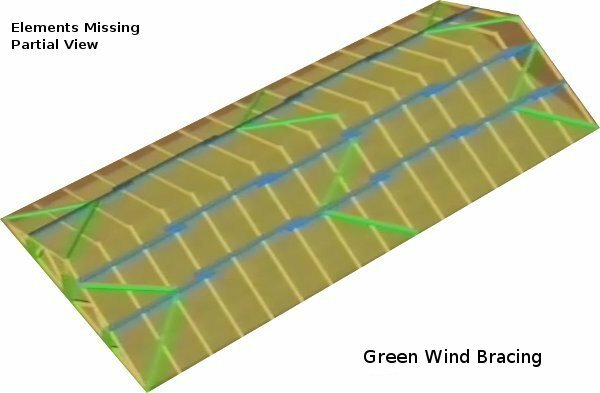 Wind bracing should be placed at 30° - 60° angles. The number of trusses clustered depends on building span and truss spacing. At both gable ends, and at least every 20' include cross bracing (red) of truss clusters. The partial images below show these critical components and their recommended placement.